Witamy na Nowy Rok! New Year's Greetings! 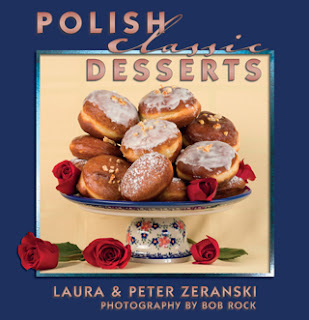 Of all the great variety of Polish pastries, Chrusciki or Favorki (in Polish) or in English: Angel Wings or Crullers, are among the best known wherever Poles live around the globe. They are beloved by children and adults alike. They can always be found at Polish Church festivals and lately in some American grocery stores, although the quality is not up to par with homemade versions. In Poland they are traditionally served between Christmas and Lent, the time of the year called Carnival, when all the best dances and parties take place. 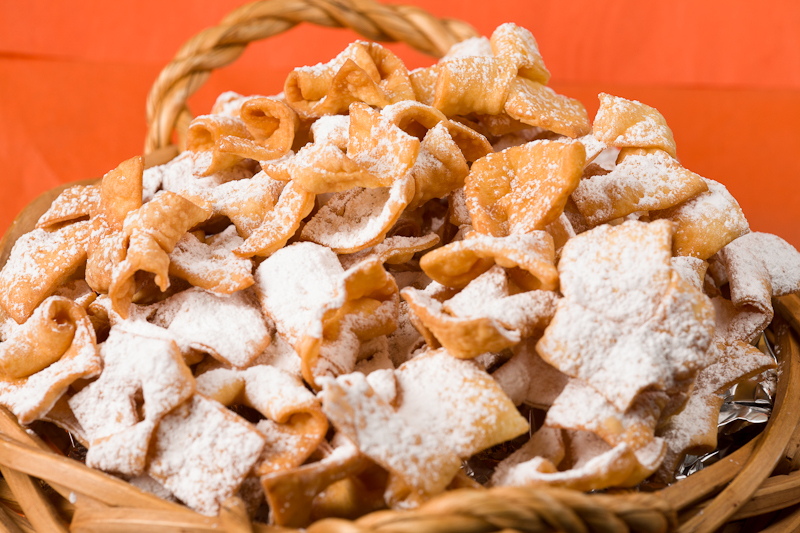 In fact we also heard that there is one tradition for husbands to give Chrusciki to their wives on Friday the 13th in order to avoid bad luck. You decide whether that makes sense. In Polish the word “Chrust”, means "dry branches broken off trees" and Chrusciki is the diminutive version. So it makes sense since these little fried cookies can resemble little dried twigs or even bow ties. There are several variations to this recipe but the one below comes from Krakow before WWII. It was given to Peter’s Mom by an excellent cook who grew up in Krakow. They are not too difficult to make and with some practice it may take you about an hour. The dough must be soft and elastic and easy to roll out as thinly as possible. This also means they will fry very quickly. They don’t freeze well and if not eaten within a day or so of being made, they tend to lose their crispiness. But they are so traditional and so delicious. Beat the egg yolks with sugar and salt thoroughly. Add the rum, sour cream, lemon juice and lemon zest, vanilla extract, and blend until smooth. Sift the flour and baking powder together. Mix into the egg mixture a little at a time to make a stiff dough. Knead the dough for at least ten minutes, keeping your board well floured as you knead. Allow the dough to absorb as much flour as possible until it is no longer sticky. Separate the dough into three portions and roll each out until it is very thin – almost transparent. Cut the dough into thin strips about 1½ inches wide and 4 inches long. Make a one inch slit, length toward one end of the strip. Pull the long end of the strip through the slit. Using a fryer or a deep pot, heat your oil to 375°F. Fry the dough strips in the hot oil, turning them at least once. (Hint: chopsticks work well as turners). Take them out when golden brown – just a minute or so. Drain them on paper towels, sprinkle generously with powdered sugar, just before serving. They are best served right away, but can be stored for a day or so in a tightly sealed, air-tight container. Looks quite tempting. Seems like a really nice way to make someone appreciate Polish culture more. Food enthusiasts should definetly give it a read.